Description - The Trumpeter Swan is one of North America's largest birds at 60-72 inches in height. The colour of the adult is white with black a bill; younger birds are a dusky grey-brown the bill being pink with a black base and tip. The voice of the Trumpeter Swan is a bugling, lower pitch. 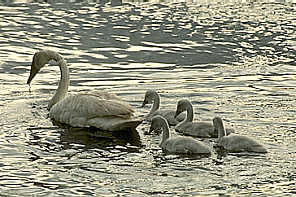 Distribution - Throughout British Columbia the Trumpeter Swan breeds in the north and winters in the west. Their preferred habitat is near marshes, lakes and rivers with dense vegetation. Biology - The Trumpeter Swan feeds on water, rooting in the shallow, mucky waters for roots and grasses; they also graze on land. The nest is built on a bulrush covered island or beaver dam and contains 4-6 whitish eggs. In the early part of this century Trumpeter Swans became almost extinct due to the draining of marshes, hunting and other disturbances along with a low rate of reproduction.